The sixth annual Speakeasy Cruise is certainly right about one thing: its party is unmatched by all the other soirees on dry land. Between two rooms of music, blackjack tables, old school candy and cigarette girls, and stunning vistas of the Golden Gate, Alcatraz, and Treasure Island, the cruise is keeping it as authentic as possible. Encouraging a flapper dress code and offering an open bar, this time traveling boat heading for the 1920s is a New Year’s destination you won’t soon forget (champagne permitting). 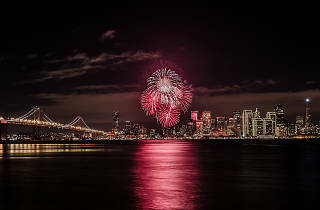 Fume Blanc Commodore, 8 The Embarcadero, Pier 40, Dec 31, 7:30pm. $249-$275.